We are excited to announce the national #BlackLivesMatterAtSchool twitter chat at 9pm Eastern/6pm Pacific so we can learn about all the protests, lesson plans, & forums you all have participated in. There are so many stories from the classroom and beyond to share about powerful antiracist teaching and advocacy–and we want to hear them all and learn from each other. Yet there are also many recent stories of police brutalizing students in school. #BlackLivesMatterAtSchool will be joining Dignity in Schools to hold a #CounselorsNotCops Twitter chat on Thursday, February 7th at 9pm Eastern/6pm Pacific. Use the two hashtags to join the conversation. 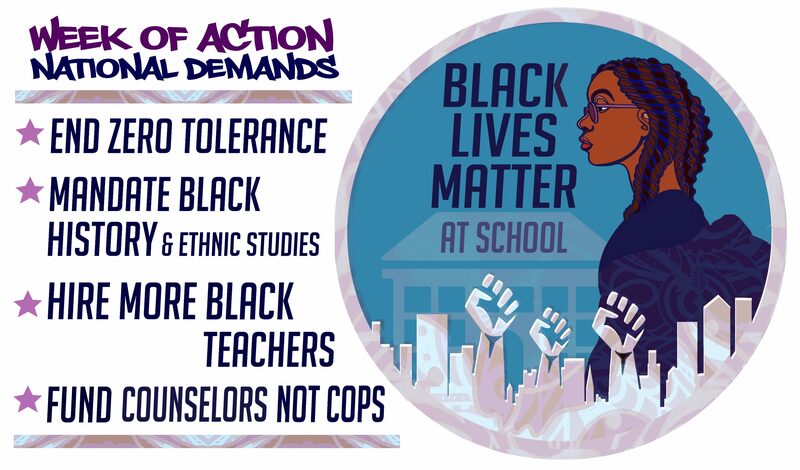 “Fund Counselors Not Cops” became the fourth demand of the Black Lives Matter At School movement this year because of educators and students experience with police in schools–and a powerful report on the many negative impacts of the policing of Black and Brown students in school. In the last several weeks alone, there have been some egregious instances of criminalizing Black youth and horrific acts of police brutality. According to the Huffington Post, on January 15, 2019, at East Middle School in Binghamton in upstate New York, four 12-year old girls were strip-searched after being accused of acting too “giddy” and suspected of being under the influence of drugs. Later, no drugs were found in their system after being subjected to the humiliation and degradation of an invasive process. We have so much to talk about, so join us for a conversation on these important topics and more!